Visual artist Bernard Hoyes has accomplished yet another career defining feat. The master craftsman was recently commissioned by a private collector to recreate the divinely celebrated winged stallion Pegasus, one of the best-known creatures in Greek mythology. The five-foot "Roots of Pegasus" bronze sculpture is currently on display until the end of June as part of the "Below Sea Level" exhibition at the prestigious Melissa Morgan Fine Art Gallery, located at 73040 El Paseo in Palm Desert, Calif.
At the close of the showing, Pegasus will 'fly' home to his owner, an accomplished equestrian whose family has raised horses for over three generations! Hoyes is world renowned for his inventive creations. His rarified sculptures transcend the norm and defy comparison. For instance, in 2007, Hoyes journeyed to the Fuzhou City in the Fujian Province of China to craft a six foot, three-ton granite rock sculpture of a blue fin tuna! 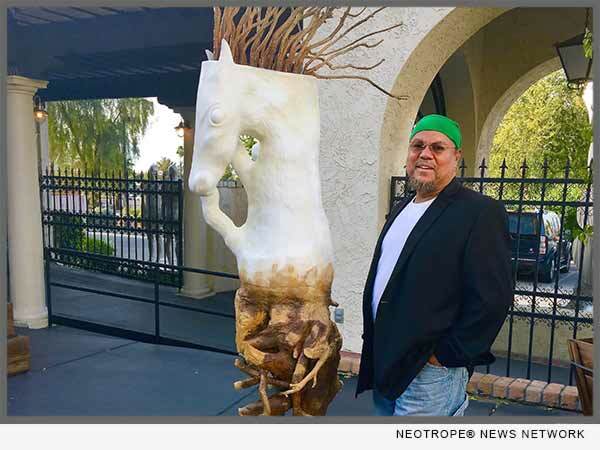 His most recent "Roots of Pegasus" is an original in wood and plaster, cast in 100 percent bronze, with white patina and wood rendered on the plaster portion. Hoyes utilized symbolism as a tool to express the mythological details of Pegasus' legend. The branches used for the mane of the horse recall Pegasus' origin, as he was birthed from the goddess Medusa, known for her hair of living venomous snakes. The roots represent his metamorphosis and the trials and exploits he traversed on earth before fulfilling his destiny, rising into heaven as a winged steed and immortalized as a star constellation. The entire work weighs in at 1,176 pounds! Hoyes is primarily recognized as a contemporary painter whose work evolves from a highly intuitive space. He is heralded for his ability to capture spiritual realms on canvas in radiant and brilliant essence. Born into a family rooted in Jamaica's revivalist church, Hoyes' memories of religion and rituals have influenced his artistic productivity throughout his life. His celebration of traditional African religion, spirituality and myths continues to find universal appeal, exciting audiences worldwide. Oprah Winfrey, Natalie Cole, Steve Harvey, Keenan Ivory Wayans and the National Urban League are among his collectors. Selections of Hoyes' work have been featured in several television shows including the Showtime cult classic series, "Dexter." President Barack Obama has even been photographed in front of his work. Hoyes' exhibition history spans over 50 years with over 100 exhibitions, 30 of them solo, in various countries including his native Jamaica, USA, U.K., The Netherlands, and Germany. Some of Hoyes' past exhibitions include "Places and Validation, Art & Progression, The Getty Initiative Pacific Standard Time" in 2010; the "Art in LA 1945-1980" at CAAM in 2011; a feature in "L.A. Rising: SoCal Artists before 1980," published by the Getty Foundation and "Se7en Paintings, a Multidisciplinary Performance" which brought Hoyes' art to life on the Ford Stage in Los Angeles in 2012. Most recent exhibits include the "Evolving Abstraction, 3 Contemporary Artists of the African Diaspora" at the Palm Springs Art Museum in Feb. 2015 and "The Spirit of the Land," at the Desert Art Collection in Palm Desert, Calif. in 2015. The Museum of African American Art (MAAA) will present a thirty-year review of his stunning collection with the exhibit, "Evolving Art Practice, Rags to the Revival Series, which opens Sunday, July 2 and runs through Sunday, September 24, 2017. The presentation will juxtapose two of Hoyes' defining methodologies. His "Rag Series" is a spontaneous technique, using a rag laden with ink, cast onto paper as a fisherman would cast his net in the sea. When lifted a print remains suggesting and delineating forms, mass and movement. Hoyes then adds details that further lift the imagery into compositions with vitality and power. In contrast, his popular "Revival Series" reflects the vibrancy of his Jamaica roots in living primary colors. Hoyes conveys rhythmic movement, deliberate intensity and spiritual forwardness that splashes across the canvas. The Museum of African American Art is located on the third floor of Macy's in Baldwin Hills Crenshaw Plaza, at 4005 Crenshaw Blvd. in Los Angeles, Calif. Whether sculpting mythological figures or evoking spirits with paints, Bernard Hoyes continues to present his art as a medium that inspires viewers to transcend into new dimensions. View his work in person at the Melissa Morgan Art Gallery and the MAAA or visit his online gallery at http://www.bernardhoyes.com/. This version of news story was published on and is Copr. © eNewsChannels™ (eNewsChannels.com) - part of the Neotrope® News Network - all rights reserved.